After months of testing and delay, Ethereum Constantinople is finally on its way. Expected to be executed by January end, the long-awaited Ethereum update is bringing with it a lot of changes. Constantinople is part 2 of the Metropolis update. We have covered Metropolis in detail before. So, in this guide let’s put Constantinople under the microscope and see what all changes it is bringing into the ecosystem. 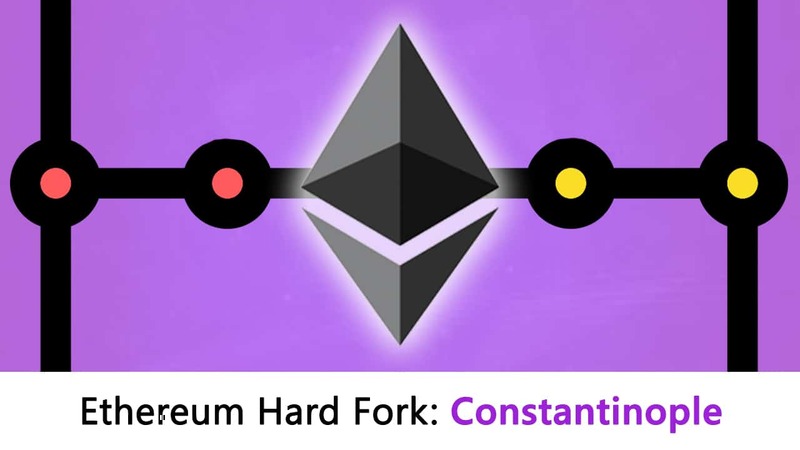 Ethereum Constantinople is going to be a hard fork. With the whole “ETH-ETC” and the “Hash War” saga, the term manages to conjure up a pretty negative picture. However, that is not necessarily the case all the time. So, before we even begin anything, let’s educate you about forking and why they are essential. A fork is a condition whereby the state of the blockchain diverges into chains where a part of the network has a different perspective on the history of transactions than a different part of the network. In other words, it is a divergence in the perspective of the state of the blockchain. Whenever a chain needs to be updated there are two ways of doing that: a soft fork or a hard fork. Think of soft fork as an update in the software which is backward compatible. What does that mean? Suppose you are running MS Excel 2005 in your laptop and you want to open a spreadsheet built in MS Excel 2015, you can still open it because MS Excel 2015 is backward compatible. 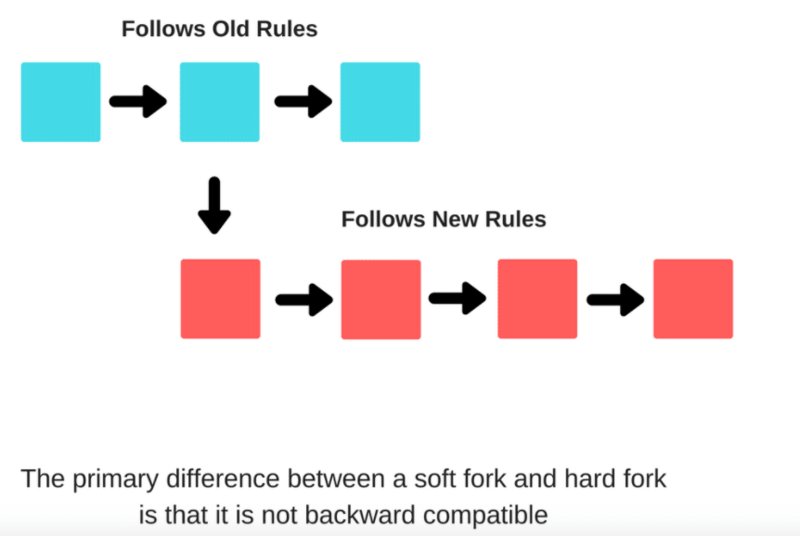 The primary difference between a soft fork and hard fork is that it is not backward compatible. Once it is utilized there is absolutely no going back whatsoever. If you do not join the upgraded version of the blockchain then you do not get access to any of the new updates or interact with users of the new system whatsoever. Think PlayStation 3 and PlayStation 4. You can’t play PS3 games on PS4 and you can’t play PS4 games on PS3. So, that is what a fork and a hard fork is. The thing is, that these forks happen all the time. All systems need to update, which is essentially a fork. It is only when the community is divided about a fork when the issues happen. Thankfully, the Ethereum community is not completely divided about the Constantinople hard-fork There are still some minor issues of course, which we are going to talk about later (check EIP 1234 section below). This, not the first time Ethereum has upgraded of course and it won’t be the last time. Ethereum was not designed to be just a mode of currency. It was designed to be a platform for decentralized applications. However, before it can do so, it needs to go through various stages of growth. With each stage, Ethereum “levels up” by incorporating more and more properties making its system more robust and seamless. EIP 145: Developed by two ethereum developers, Alex Beregszaszi and Pawel Bylica which introduces a native ‘bitwise shifting’ that can run through bytecode at a cost which is similar to other arithmetic operations. EIP 1052: Offers a means of optimized large-scale code execution on ethereum. This will allow only the compressed code containing essential contract data is checked, as opposed to the whole code. This was authored by Nick Johnson and Bylica. EIP 1283: This EIP is based on EIP 1087 which was again written by Nick Johnson. This EIP helps in reducing the amount of gas developers need to pay to run and execute their smart contracts by cutting off excessive and unnecessary gas usage. EIP 1014: This EIP was created by Vitalik Buterin himself. This will basically help Ethereum to leverage state channels to enable them to communicate with off-chain addresses. This will help in the scalability of the entire system. EIP 1234: Easily the most controversial update which has been championed by the release manager of Parity, Afri Schoedon. This will gradually remove the difficulty bomb from Ethereum’s system and reduce block reward from 3 ETH to 2 ETH for a 12-month period. Now, let’s look into all these EIPs in detail. A bit shift is a bitwise operation which moves each digit in a number’s binary representation to the left or right a required number of times. The “<<” is the logical left shift operator while “>>” is the logical right shift operator. To understand how it works, let’s consider an example. This will push the digits to the right side by one. The last digit, which in this case is “1” gets completely removed and lost. Plus, a “0” is always added in the beginning. So, 00000011 >> 1 will become 00000001 or 1. In this case, the digits are shifted towards the left, and the left most digit, in this case, “0” gets pushed out. After that, a “0” is added at the end. So, 00000011 << 1 becomes 00000110 or 6. Now, if you look in a little more deeply, you will observe something quite fascinating. If you left shift a binary number N times, then it multiplies that multiplies that number by 2^N times. So, 0010 is 2 and left shifting that by 1 gives us 0100, which is 4 or 2*(2^1). Two left shifts gives us 0010 << 2 —> 1000 which is 8 or 2 * (2^2). On the other hand, if we right shift a number N times, then we divide the number by 2^N and the quotient is the answer (you throw away the remainder). So, let’s right shift 8 2 times. 1000 >> 2 will give us 0010 which is 2 or 8 / (2^2). These operations when done in sequence can become really expensive. However, one single operation which covers both of these is much cheaper. This will help Ethereum developers with code optimization. What this does is that it will help underlying decentralized applications like CryptoKitties to be processed faster by the Ethereum Virtual Machine(EVM). This EIP will help specify a new opcode, EXTCODEHASH, which returns the keccak256 hash of a contract’s code. The thought process behind this is to only allow essential data of the contract code to be checked rather than the entirety of the code itself. Many contracts need to perform checks on a contract’s bytecode, but do not necessarily need the bytecode itself. Eg. a smart contract may need to check another contract’s bytecode if it belongs to a particular group or not, or it may perform certain analyses on code and whitelist any contract with matching bytecode if the analysis passes. Currently, the contracts do this extremely inefficiently by using the EXTCODECOPY opcode but it is extremely expensive for large contracts. The EXTCODEHASH opcode will only return the keccak256 hash of a contract’s bytecode and help developer save a lot of money. So, what are state channels? Let’s look at the requirements to do an off-chain state channel? That is the main use case of a state channel, it will immensely help in blockchain scalability. In fact, Bitcoin’s lightning network is essentially a fancy state channel which deals only with payments. Now, we have covered all this in our article on the Casper Protocol which you can read right here. The miners solve cryptographic puzzles to “mine” a block to add to the blockchain. Ethereum, as of right now, is using the Proof of Work (POW) consensus mechanism. Now, that you know what POW is and the role that the miners play, it is time to understand what “difficulty” means. Ok, so before we understand the term, let’s do a thought experiment. The idea behind mining is for miners to use their mining power to solve these cryptographically hard puzzles and get Ethereum in return as a reward. Unlike Bitcoin, Ethereum doesn’t have a hard cap on its total supply. But, you still need to regulate the amount of Ether that is floating around in the system to make sure that the supply-demand equation doesn’t go out of balance. This is why, both Bitcoin and Ethereum have a “difficulty” parameter hard-coded into their system. The difficulty makes sure that the time taken between the creation of the blocks remains the same. So, if the block creation time is too low, then the difficulty goes up and if it is too high, then it will go down. The following chart shows the difficulty in Ethereum’s network from December 11, 2018, to January 11, 2019. Alright, so now onto Proof of Stake (PoS). Ok, so now you know the bare details. You know the basics of PoW, PoS and difficulty, now let’s get into the bare details of EIP 1234. Ethereum’s method of PoS implementation is called the Casper Protocol. Obviously making a sudden shift from PoW to PoS will be extremely inadvisable. In order to smooth over the transition, Ethereum is going to first introduce a hybrid PoW-PoS consensus mechanism called “Casper FFG”. As a part of this transition, they have decided to also introduce a “difficulty bomb” which will make mining so hard on the Ethereum blockchain, that the miners will have no incentive to do so and everyone will eventually move on to PoS. The point where mining becomes so difficult that it is almost impractical is called the “ice age”. The difficulty bomb was introduced on 7th September 2015 and has been programmed to raise difficulty exponentially. Now, this is all well and good, however, the Casper Protocol is not ready yet for full implementation and there is still some work left to be done. This is why, instead of just delaying Constantinople as a whole, they have delayed the difficulty bomb by 29 million seconds or approx 12 months. Because the difficulty has been delayed it will become much simpler for miners to mine blocks and they will be able to do so with much more regularity. So, to counterbalance this, the block reward will go down from 3 ETH to 2 ETH. This reduction can be thought of as a “stop-gap” to the “supply bleed”. However, there are other members in the Ethereum community how have opposed this EIP arguing that the reduction of the difficulty will lead to more centralization. The entire crypto community is looking forward to the Constantinople hard fork. By doing that, Ethereum will take another major step toward serenity and full implementation. As you can imagine, there are some truly radical changes coming in which will not only greatly benefit developers, but it will help them gain momentum towards full PoS implementation as well. We just have to wait and watch to see how it all works out.